Developer: High Voltage, Midway Games Inc. 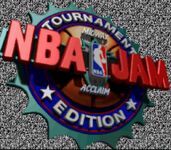 Your state-of-the-art system demands a state-of-the-art NBA JAM TE - and this is it! Arcade-quality player scaling! Updated player rosters! Actual player heads! Want more? We've got all-new secret characters! Monster-jamming stereo music and authentic arcade sound F/X - including voice calls for individual players! NBA JAM TE..pump it up!